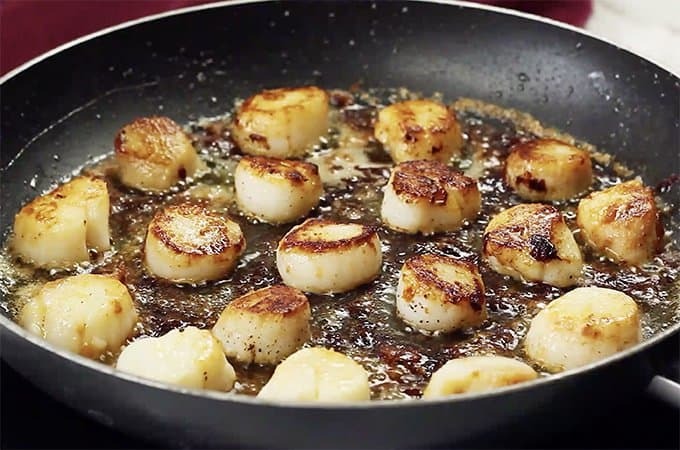 Pan Seared Scallops Recipe – Alton Brown Style. If you thought you could only get delicious sea scallops like this in a fancy expensive restaurant, we’ve got great news for you. Enjoy these succulent scallops at home today and you’ll be surprised at how affordable this meal is to make! We make a lot of healthy seafood recipes here on Platter Talk and sea scallops are one of my favorite gifts from the culinary world. Although it’s hard for me to say which seafood I love most. As my mom was known to comment on her six kids, “I love them all, equally.” I have to say the same when it come to food from the sea. With that in mind, this evening I decided to tackle sea scallop and did a darn good job I would say, thanks in large part to the legendary Alton Brown and his pan seared scallops recipe. To be clear, living in the landlocked portion of the United States known as Wisconsin has presented challenges when it comes to finding fresh seafood. It’s an oxymoron. Sure, we have an abundance of wonderful-to-eat fresh water fish such as perch, bass, and walleye from some of our bordering great lakes and even the rivers that flow through our state. Seafood such as tuna, grouper, shrimp, lobster, – well they are an entirely different story. And sea scallops. 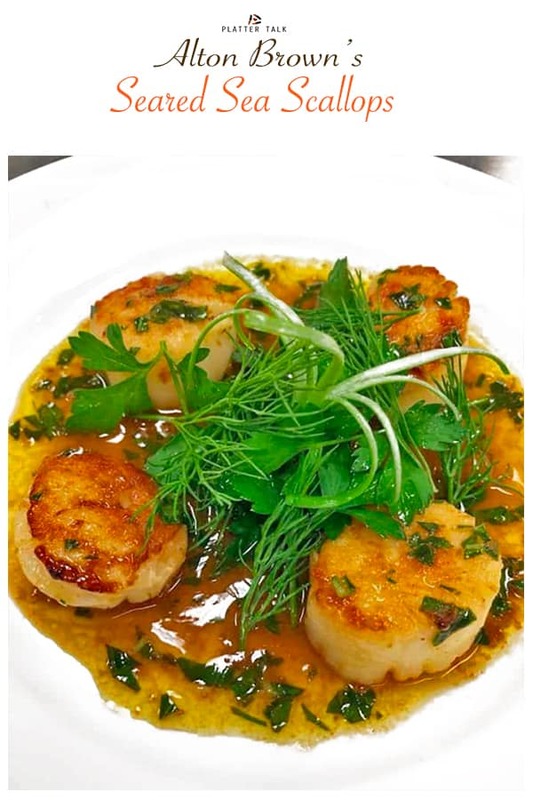 We see sea scallops in the seafood cases of all the major grocery stores throughout the U.S. and these scallops appear ever so plump and juicy, just begging to be taken home and enjoyed. The very sad part of this scenario lies in the fact that many times their plumpness and juiciness lies not in their own natural goodness, but rather in the taste sucking evils of a preservative that goes by the name of sodium triphosphate (STP). Besides being used as a preservative for much of the seafood we see in our grocer cases, it’s also a primary component of detergents. Nice eh? Not. 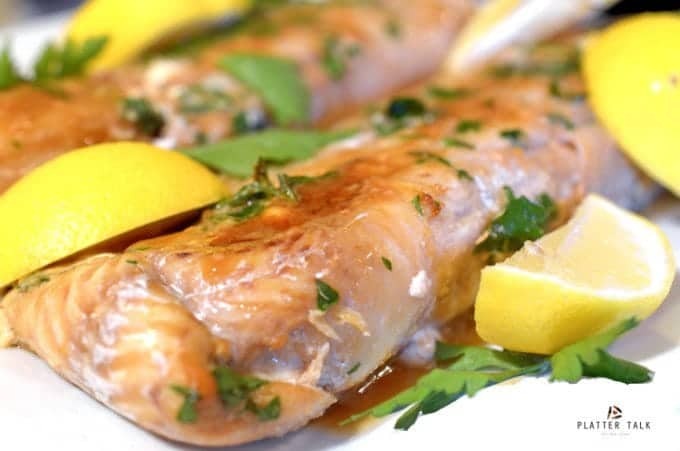 Try our Healthy Haddock Recipe! This healthy haddock recipe has an Asian twist to it, thanks to fresh ginger and soy sauce. The moral of this story: Look for sea scallops that are not preserved in STP. Instead, look for dry-packed scallops. Dry-packed scallops are sea scallops that are shucked, packed up and shipped on ice without chemical additives. They taste better than wet-packed scallops, which are soaked in water and STP, meaning the scallop becomes bloated with water and food additives, resulting in a duller flavor. Scallops with too much moisture are also less successful in the pan, since excess water seeps out, preventing a flavorful crust from forming on the outside of the scallop as it cooks. Dry-packed scallops may also have a stickier texture and a slightly more pronounced smell, which is nothing to worry about. They cost more, but have a naturally sweeter taste. When pertaining to food and cooking, searing is just a cooking technique that browns food quickly at a high temperature to help it retain its juices in subsequent cooking. A good sear also give some nice texture and pleasing but gently crunch with every bite. Most foods an be seared such as steaks, seafood, vegetables and more. Here is another of our seared recipes, Cayenne Seared Pork Chops with Orange-Glazed Carrots. Use a paper towel to pat dry the scallops prior to pan searing. The first thing to do when getting ready top sear your scallops is to pat them dry with a paper towel. This will remove excess moisture and is a critical step in attaining a good sear. Salt and pepper is the only seasoning needed for this scallops recipe. Next, for this scallops recipe, season the scallops with some salt and pepper. 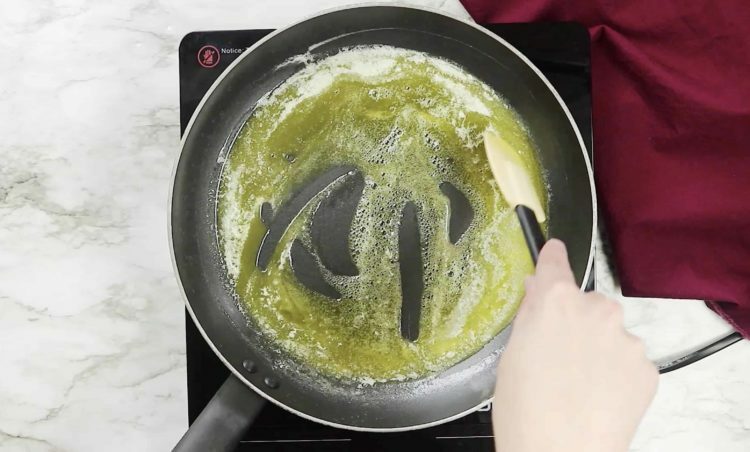 Combine oil and butter in a skillet. Heat the oil and butter until hot but not smoking. Once the scallops are dried and seasoned, it’s time to get the skillet out. Butter and oil are used in combination because oil can be heated at a higher temperature without smoking, which can cause changes in chemical structure and be bad for your health. Read about different cooking fats and their smoke points to learn more. Simply place the scallops in the hot fat and let sear for about 2 minutes. Flip each scallop and cook for another 2 minutes. Once your butter and oil are hot, place the scallops in the hot skillet and let sit for about 2 minutes. It’s important not to play with them by moving them around, you want to allow a nice crisp sear to form. About this time in the cooking process, these seared sea scallops are going to really start smelling good! Flip the scallops and repeat the searing process for the other side. This scallops recipe can be made in a matter of minutes! We are fortunate to have a grocer who stocks dry pack-packed scallops and just as lucky to have a resource such as Alton Brown, whose recipe for seared scallops lists a prep time of five minutes and a cook time of three minutes. Can it get any simpler? Can it be any tastier? With dry-packed sea scallops, the answer to both questions is absolutely not. I hope you will give this pan seared scallops recipe a try. Pinot Grigio. Refreshing and citrusy, the flavor of this light tasting white wine will not over-power the tastes of these delicious sea scallops. 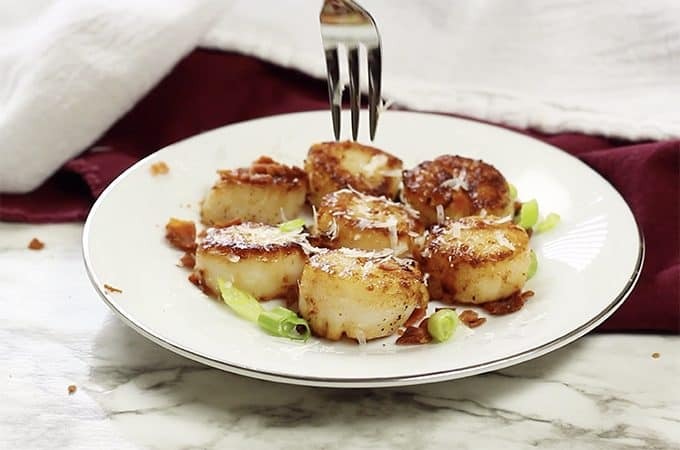 Look for dry packed sea scallops and then try this pan seared scallops recipe tonight! Drying the scallops (with paper towels) is critical when searing. Warm serving plates in the oven to preserve and maintain the heat of the entrée. Thanks for the great comments, Janet and Aldi is my go-to place for scallops! I will say that I like most offerings from the sea but I will say that scallops have not been my favorite, but I am willing to give them another chance with this recipe! The sear on those scallops is amazing! Brooks loves scallops so I know he will be excited when I make him this for Father’s Day! Thanks for the comments, Jen. I’d make these for you if I could! I love scallops and also learned how to sear them for the perfect crust from Alton Brown. The man is a master! I didnt know about the STP in them… and am now on a mission to find them dry packed! What great information for me as someone who is really into what is being put into her food! Thanks! Thanks so much for the great comments, Michele. And yes – we are huge AB fans! I love scallops, but I have been intimidated about making them at home. 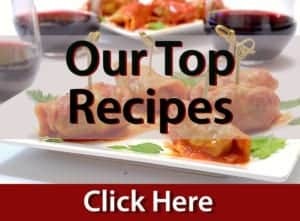 So many tips for purchasing them and cooking them, right here in one spot!! Thank you! Give these a go, Michaela! Thanks for the comments! Scallops are delicious and wow, the bits of crust formed from the butter and oil looks so tasty! I’ll be asking for dry packed scallops for now on! Thanks for the tip. Popping back by again to grab this recipe – I’ve made it several times and we just love this meal! Thanks for the return visit, Debra. We always love hearing from you! I haven’t tried scallops for long time. Now only going for salmon, shrimp. I think your recipe sounds delicious and when I buy the scallops I am going to try it. Thanks so much, Swathi, I think you will enjoy this method of preparing this treat from the sea! Ooh no not all equal for me! Joint first place is lobster and crab, with very close joint seconds for large prawns and scallops, then below that come the rest – mussels, cockles, calamari, octopus, tiny prawns, whatever else you can think of! My husband looooves seafood so he’d be over the moon if I made him these! Thanks for the recipe! Scallops are one of my weaknesses. I’ve never tried making them before, though! Things I never knew about scallops… STP. On the way down to the freezer to check out the latest batch I bought from the restaurant supply store. They are huge but not as sweet as the ones I usually buy. Could this be the culprit? I’ll let you know! Thanks Dan! Thanks so much for the comments, Beth! Happy scallop eating to your and yours! Scallops are such a wonderful dinner item. All the ingredients in this recipe are so well paired. Thanks for the tip on dry-packed scallops! Scallops are so delicious! 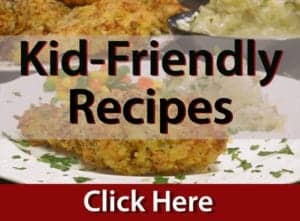 I don’t know why I don’t cook them more often– so easy, right? These look beautiful. The perfect pan seared scallops has always alluded me also. Thanks for the great tips!! Well done on these scallops! But now you have me freaked out about sodium triphosphate! In a good way though. Thanks for the heads up! Thanks for the comments, Brian and I’m in complete agreement with you! Scallops are totally delicious, and sometimes they are overcooked when you have them in a restaurant, but your recipe sounds perfect! I have a few scallop lovers in my family! Wow, these scallops look amazing! I am going to have to try these! What a gorgeous, special treat these are. Scallops are something Hungry Hubby loves and orders if we go out for a romantic meal together – I must have a go at cooking them for him! I wanna pair this seared scallop with sake! Simple is always BEST! Sounds like a perfect combo! I just love scallops! Love the crispy caramelization on these! I completely agree with you on dry scallops – most vendors sell wet scallops and make no mention of that fact. I always ask and if they don’t know — I assume they’re wet and don’t buy them. I have two good fishmongers where I live and trust them to give me the real thing. Such a treat! Scallops are my fav! I saw on America’s Test Kitchen that you can soak the scallops in ice water and lemon for 30 minutes if you can’t find the dry packed ones 🙂 It’s saved me a few times!! I don’t get to enjoy these enough and I should being out here in the Pacific NW. One of my favorite things to cook, especially when you get that gorgeous caramel sear on them. Yum! We love scallops! These look amazing! Thanks, Ladies. These are so simple and so succulent. I hope you give them a try. Those look wonderful. They are something I still need to tackle in my own landlocked kitchen. Michelle, I hope you try this recipe; it’s great for scallop novices like myself and it sounds you too! Thanks for the comments!